Cyberspace coordinates: The World is Waiting — Expat humour, travel tips, handy hints, photos and inspiration for travellers (site); @worldswaiting (Twitter handle); The World is Waiting (Facebook); WorldsWaiting (Pinterest); and Liv G (foursquare). Though I am fond of Britain, I left because I was seeking work as a scuba diving instructor and underwater photographer. The jobs available overseas offered a better diving experience and a better lifestyle. Photographing sharks, filming turtles, and teaching people to dive in an island paradise conditions are not things you can do in Britain. My parents were expats in Luxembourg, which is where I was born. For a few years my father was based in Barbados for work, so I guess it runs in the family — but nobody other than me is displaced at this moment. Your chosen profession of diving and underwater photography has led you to settling, at least for a time, in quite a few different countries. Tell me about the moment when you felt the most displaced. I believe it is the people who make the place. I feel most displaced when I am surrounded by people who do not treat others with what I consider to be the most basic level of respect — basically, as they would wish to be treated. Discovering cultural differences can be fascinating; but living with discrimination day in day out is frustrating and awful. Living in Egypt I found it really frustrating that men would not take me seriously simply because I am female. They completely disregarded the fact that I had more experience and was more qualified than they were. Of course I understand there are significant differences between Arab and Western culture. But being in a male-dominated industry (scuba diving) in a paternal society (Egypt) was simply not for me. Was there one specific moment during your time in Egypt that catalyzed this feeling for you? No, I think it was more the growing realization that I would never be taken seriously. Describe the moment when you felt your least displaced — i.e., when you felt more or less at home in one of your adopted countries. The first time I lived somewhere other than with my parents, was in Turkey in my late teens. I took on the responsibility of earning enough to pay rent, bills and to feed myself — and it was all in Turkish. It was a classic example of me diving in at the deep end, so to speak. As a result, I quickly gained a working knowledge of the Turkish language as well as an understanding of the country, culture and its people. Initially I thought that my Turkish friends would be horrified by my near constant butchering of their language. But they only ever encouraged me — and even nicknamed me “the Turkish-English girl.” Nowadays, whenever I visit Turkey I feel very at home there. I don’t have the normal visitor’s questioning of things. I still have quite a few Turkish habits like always removing my shoes indoors, being quick to hit the horn whilst driving, and showing hospitality to visitors. You may bring one curiosity you’ve collected from each of your adopted countries into The Displaced Nation. What’s in your suitcase? From Turkey: An evil eye. Evil eyes are so-called, rather misleadingly, as they are believed to ward off evil. They are usually made from glass or ceramics and are often seen hanging over entrances to offices and people’s homes. From Kenya: Some beaded sandals made from leather and old car tyres. They are the most comfortable sandals I ever had. From Egypt: Egyptian hibiscus tea. They serve it warm with a classy piece of foil over the top of the glass! From the Bahamas: Pink sand from Harbour Island. All Bahamian sand is silky soft and impressive frankly but on Harbour Island it is even more beautiful for being a dusky pink. From Barbados: An amazing reggae soundtrack. From Australia: Can I bring a quokka? They are small marsupials, a bit like a large-bottomed mini-kangaroo. I find them endlessly amusing. And now you are invited to prepare one meal based on your travels for other members of The Displaced Nation. What’s on your menu? Starters: A huge plate of Turkish meze including filled filo pastries, various dips, Turkish bread, olives, cheese and some köfte. Main: Bahamian conch fritters — the conch will be fresh from the sea and delicately fried — served with lime coconut dip and salad. Dessert: An Australian pavlova, covered in fresh fruit. Drinks: To include Caribbean piña coladas and mojitos, and Turkish cherry juice. It would be a strange meal perhaps, but very tasty! I wonder if you could also add a word or expression from one of the countries you’ve lived in to The Displaced Nation argot. A traveller through a country would stop at a village and he didn’t have to ask for food or for water. Once he stops, the people give him food, entertain him. That is one aspect of Ubuntu, but it will have various aspects. Ubuntu does not mean that people should not enrich themselves. The question therefore is: Are you going to do so in order to enable the community around you to be able to improve? Your life thus far has been quite an odyssey. You’ve traveled to 42 countries and lived in six. Do you think of yourself as a travel pro? I don’t consider myself a professional traveler. To me, that term implies that I am paid to travel, which is certainly not the case. I am inspired to continue traveling to new places because I enjoy learning about people’s lives and cultures, and seeing the world through their eyes. I find the different foods interesting as well. Travel also allows you to see where you have come from in a whole new light. Oh, it’s endlessly growing! Top of the list currently are the Philippines and the Galápagos. But you are a professional scuba diver. Did you watch the diving events in the London Olympics? I wasn’t able to watch most of the Olympics because of the time difference between Australia and Britain and a recent spate of overtime at my job. However, to answer your question, no, I have little interest in competition diving. I am not a competitive person generally and rather believe that at the end of the day the only person you ever truly compete with is yourself. What made you so certain you wanted to be a scuba diver? I enjoy interacting with the creatures of the deep. Watching as a shark cruises out of the blue towards you, having a curious manta ray investigate you, or sharing a moment with a cheeky turtle is far more fun to me than being faster or more coordinated than someone else. I also enjoy the challenge of capturing the underwater critters on camera. As it happens, this week marks the 25th anniversary of Shark Week, the Discovery Channel’s longest-running programming event. The purpose is to draw the attention to the shark species, one third of which is at risk for extinction. (We must all stop eating shark fin soup — up to 73 million sharks are killed each year for their fins!) I understand that you love to video and photograph sharks. Is that the riskiest thing you’ve done under water? Most people would say the riskiest thing I have done underwater is feed sharks. It’s not about thrill-seeking, though, but about providing divers with an up-close encounter, which I think is the best way to educate people about and ultimately protect the sharks. But while you are a shark lover, you have an aversion for sea urchins. Why is that? If you ask me that question, I have to assume you have never accidentally brushed past one and received an ankle full of their bloody painful spines?! But have you ever eaten uni in a Japanese restaurant? No. I love sushi but haven’t managed any sea urchin yet. Have you, is it good?! STAY TUNED for tomorrow’s compendium of books on travel to Tuscany. 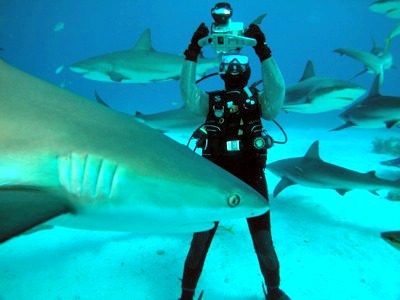 img: Liv Gaunt videoing a shark feed in the Bahamas.